England manager Gareth Southgate has named four uncapped players in his 27-man squad to face the Netherlands and Italy on 23 and 27 March. 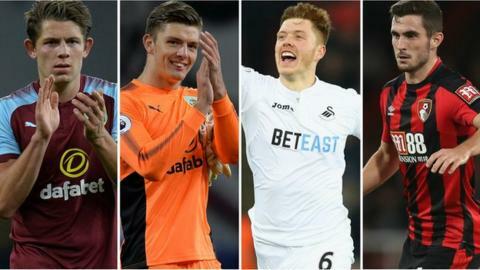 Burnley's James Tarkowski and Nick Pope, plus Swansea defender Alfie Mawson and Bournemouth midfielder Lewis Cook have all been included. There are also places for Arsenal's Jack Wilshere and Danny Welbeck. Injured Tottenham striker Harry Kane and Chelsea defender Gary Cahill are among those who miss out. Wilshere, 26, returns to the squad, having last played for England in the 2-1 defeat by Iceland at Euro 2016. But the midfielder has enjoyed an extended run of games in the Gunners' side. Goalkeeper Pope's call-up is reward for his impressive displays since replacing the injured Tom Heaton at Burnley. The 25-year-old is one of four goalkeepers named in the squad, with West Ham's Joe Hart also included alongside Jack Butland (Stoke) and Jordan Pickford (Everton). Southgate explained his selection process had been complicated, saying: "My preference is always that you have clarity for the players, in terms of you need to be playing regularly, you need to be in good form. "It's obvious to everybody we have a very small number of English-qualified players in the Premier League. On top of that a lot of our better players have missed time with injury or through selection have missed matches. "There are clearly some inclusions of players that are playing well for their club and who are getting their first call-up. So there is a little bit of a complex minefield to get through." Gareth Southgate said his focus was solely on preparing the team for the World Cup in Russia but that he recognised the "seriousness of the situation"
With only three months until England play their first World Cup match in Russia, Southgate was also asked whether he had any concerns for his players following a nerve agent attack on a Russian former spy and his daughter. The UK government, which blames Russia for the attack, says ministers and members of the Royal Family will not attend the World Cup, which starts on 14 June. But Southgate said he remained fully focused on preparing his team for their first game against Tunisia on 18 June. "Clearly it's a really serious matter and it's developing very quickly," he said. "But my job as the England football manager is to concentrate on the football and prepare the team. As far as all my briefings and information goes, we're preparing to go to the World Cup. "And the only thing at this stage that is of highest importance is the safety and security of our players and absolutely of our travelling supporters. They're the things we're focused on really. "The players will have things they are uncertain of. So we have to make sure we give them all the facts we have, allay fears they have and make sure they and their families are safe and secure." Kane's omission through injury, with the Spurs striker expected to return in April, has left a big hole in Southgate's attack. Kane has scored 24 Premier League goals this season, and has 12 goals in 23 appearances for England. Welbeck has been recalled despite only making two Premier League starts since October, but his England tally is healthy with 15 goals in 36 appearances. That makes him the top scorer in the squad and the only player in it to reach double figures. Manchester United's Ashley Young is second with seven England goals from his 31 caps. "I think the medical reports we have are that for sure [Kane] will play well before the end of the season," Southgate said. "It's a disappointment for us not to have Harry with us. "But I think of the 14 matches I've had in charge he's only actually been available for six and within those six he's scored seven goals. So there's an indication of his importance and his standing for us. "Having said that, we've had to cope without him and it's important we're able to cope without him because you never know what's going to happen in football." The inclusion of Tarkowski, 25, and Mawson, 24, has come at the expense of Cahill, plus Manchester United's Chris Smalling and Everton's Michael Keane. Southgate said it was "probably a very difficult call" to drop Cahill, who has captained England. "There are a few players that are not in this squad that are not out of our mind," he said. "There are some in particular that if they were playing at the moment they would have been in - Fabian Delph, Phil Jones and Ruben Loftus-Cheek. "They are all close to fitness but have not played in matches and are in the early stages of their recovery. Plus Harry Kane, they are four that would be in our thinking." Tarkowski's call-up comes after impressive form for Burnley, who are seventh in the Premier League and only concede a goal every 122 minutes when the centre-back plays. Mawson's displays at Swansea have helped his side move away from relegation trouble. Hart might be the most experienced goalkeeper in the squad, with 75 caps, but he has only made one Premier League appearance since 30 November. "Clearly the number one jersey is up for grabs," Southgate said. Butland, Pickford and Pope have seven caps combined but more recent playing time for their clubs. Southgate said there was still room for Manchester City goalkeeper Hart, who is on loan at West Ham. "Joe has had a difficult period with his club and he had to miss out on selection a few times when [West Ham boss] David Moyes came in," Southgate added. "He's got a great number of caps and he's the most experienced keeper in our squad so we wanted to keep him around." Southgate described the form of Pope as excellent, adding: "It's great credit to [manager] Sean Dyche that we have got two Burnley players in our squad.